In the grad seminar I’m currently teaching on postcolonial ecologies, we did one unit on the struggles rural people in India have faced over the last two decades, roughly since the beginning of neoliberalism in the country. Among the many problems faced by farmers, debt figures prominently. All too often, crippling debt leads farmers to take their own lives. Thousands of Indian farmers have done so over the last two decades. As the work of Mahasweta Devi makes clear (we read Imaginary Maps), this problem of farmer debt also has a gendered dimension. Debt leads families to sell their children to unscrupulous loan sharks, who often force young girls into prostitution. Even in less dire cases, however, the problem of debt, gender, and farm labor is an onerous one. 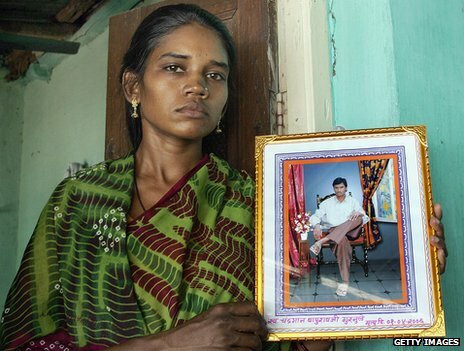 In the photo to the left, for example, we see a widow posing with a photograph of her dead husband. The assumption is that he was the farmer and that she was the farmer’s wife. Yet in many cases it is women who are the farmers, and it is often women who are committing suicide. A recent documentary by Deepa Bhatia brings out some of these dimensions while giving a chilling overview of the silenced crisis of the countryside in India. The film is called Nero’s Guests.